Join the engineers, developers, operations pros, and technology leaders defining the modern, IT-driven business. I loaded up on great ideas and am really looking forward to bringing them back to EA. We'll be a better team with new and innovative ideas fueling us. 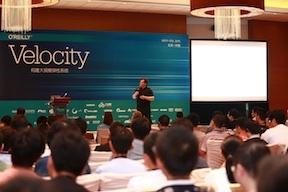 Thanks to all the cool people we met at Velocity. If you need to create sites, apps, and services that are fast, scalable, resilient, and highly available (spoiler: you do), then you need to be at Velocity. Learn directly from the smart, innovative people who have built end-to-end optimization into their businesses through rapid development, continuous deployment, deft instrumentation, and automated feedback loops—and fostered the organizational culture needed to make it work.